One of Android phones’ advantages is that they are very customizable. You can make your phone truly unique by changing themes, downloading third party apps (which is not recommended though) and, of course, adding cool widgets. How to use widget apps? When you download a widget app, there is no way to use it just by tapping its icon. In order to place downloaded widgets on your screen, you need to go to the app drawer and tap widgets tab. If you’re in the right place, new widgets will be there to choose. Tired of your default clock? Wanna find something more interesting or, maybe, create a clock widget by yourself? The apps below will help you to do both! Just check the list and choose what you need! 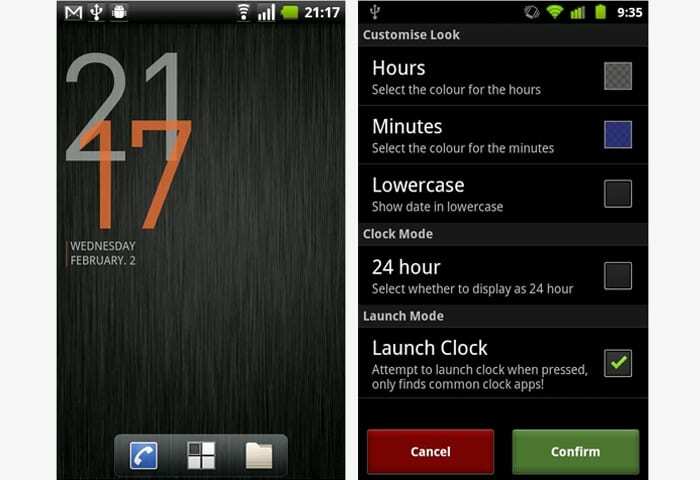 Clock Widget is a very customizable clock widget app. You can change widgets’ style, text color, transparency, size and so on. What’s remarkable is that there are lots of amazing fonts to choose, so you can create something that perfectly suits your theme. Clock Widget reflects time and date, which is the only information most users usually need. When you tap an app’s clock widget, you open alarm settings (as usual) and widget settings. So, for all the minimalists out there, this app is what you truly need! The app works with Android 4.1 and all the newer versions. Chronus is an extended widget app. It not only has clock widgets but also weather, calendar, news, tasks widgets and others. All of them can be changed according to your taste. Not all of them are free though – in order to get access to some widgets, you gotta get premium. The advantage of this one is that you can have lots of information in just one widget. If you are one of those practical people, get this app as soon as possible! 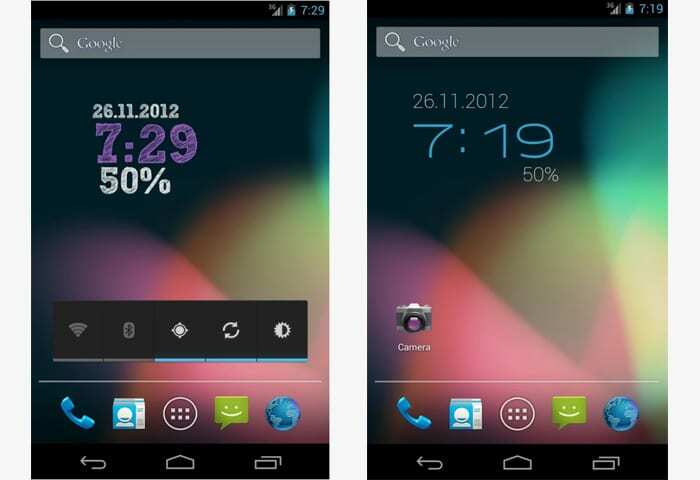 UCCW takes a full advantage of Android’s easy customization. With this app, you can create a truly unique skin by changing layout, forms, fonts, images and so on. You can download a ready skin if you don’t want to spend time on creating your own one. This gives us a huge clock widgets’ choice! And not only clock widgets, you can create/choose weather and battery meters widgets as well – or mix everything altogether. Once again, it’s worth mentioning that there are lots of stuff you can change or make up. If you created a very cool skin, you can share it with others. All in all, if you seek freedom to use your creativity or just lots of options at once, this is probably the best app to choose! 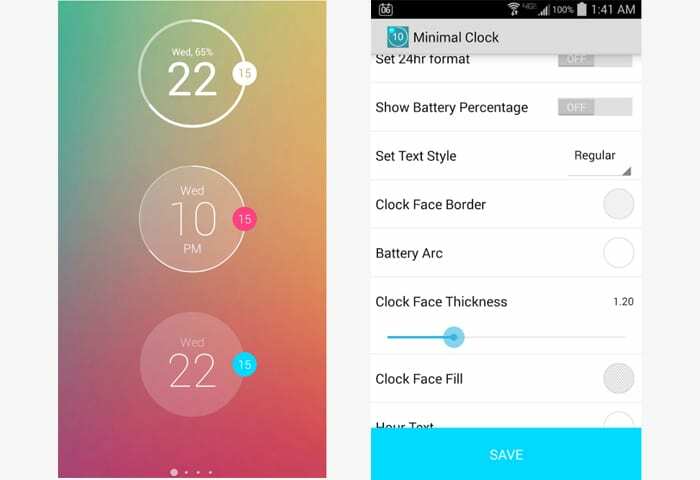 Lines Clock is an example of skin created with UCCW. In order to use this clock widget, you gotta have UCCW app installed on your phone. If you do, great! – means you can use this fantastic clock, date, weather widget. Minimalistic text is a name that speaks for itself. The app allows users to create time, date, and weather widgets using text. These widgets turn out to be very minimalistic and just nice to look at. Needless to say, that everything is highly customizable. So, one more great app for making personalized widgets! ClockQ is very similar to the app above. This one also helps you create personalized widgets for your homescreen – you can choose fonts, colors, transparency, apply shadows and change size. A widget may consist either of time or of time and date. You can also add battery level. So, if you like this simple nice app, just tap ‘Google Play’ button down below! DashClock Widget reflects not only time but also such things as weather, missed calls and messages, unread mail, scheduled alarms and calendar appointments. In a nutshell, everything that might be interesting to you the moment you grab your phone. A very practical & useful clock widget app! 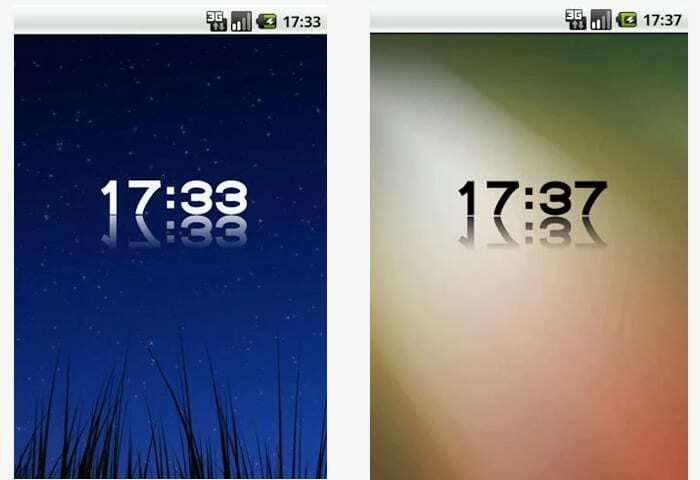 Jelly Bean Clock Widget is a cute minimalistic clock widget that would look nice with every theme. You can choose what app to open when you tap the widget (including alarm app), whether to show date or not, what color it would be and some other details. The good thing about this app is that it’s quite old, which means it can be installed even on Android 3.0. So if you like the look of this widget, no need to wait – get it now! As for the old widget apps, this is one of them. The app can be used on any existing Android version! Nothing extra – just a simple black / white clock, almost retro. This app is an excuse here to explain the reason why clock widgets apps used to be more popular than they are today. 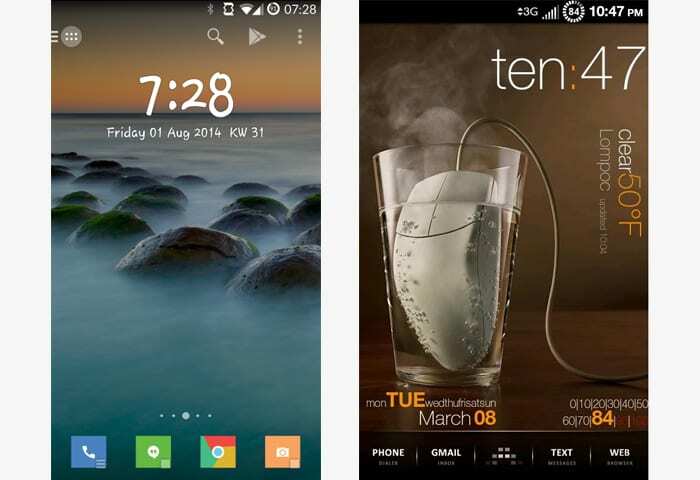 Here is a little secret – today clock widgets are downloaded into your phone together with the themes that you use. At that, a clock from one theme can be used on another. And this is not how it used to be! Today, though, clock widgets apps can be used in case you’ve found your favorite theme and just looking for something to complement it. Of course, if you want to, you can get D-Clock! 😉 Simple and cool. 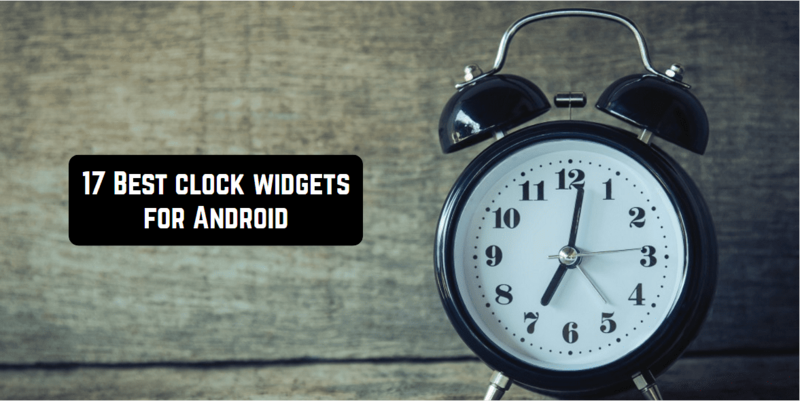 Fancy widgets is one more app that is suitable for all the versions of Android. This one is a bit more interesting though. It shows both time and weather, both separately and together – any way you want. There are also such fancy features as moon phase calendar, sunset/sunrise calculation, battery level, and others. Get this one if you want to! Or not. This is your choice! 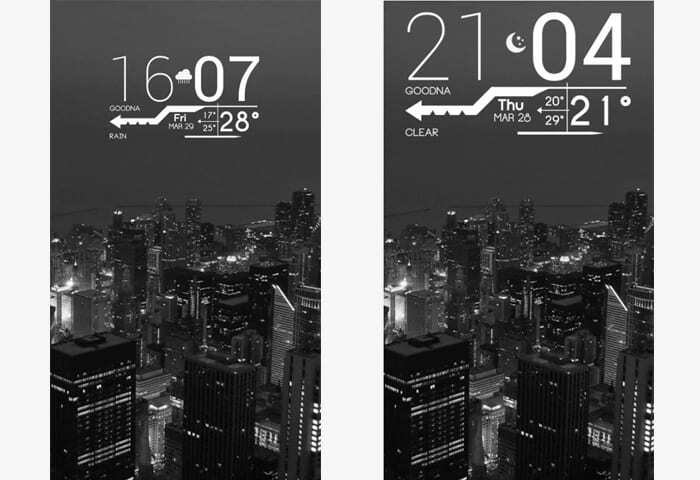 Digi Clock Widget is suitable both for phones and tablets. It has 5 different formats of clocks – a small one, a small wide one with seconds, a big one, a very big one for tablets and a very very big one also for tablets. Having chosen a format, you open up a huge customization set that allows you to choose fonts, colors, shadows, outlines, transparency, etc. What is special about this app is that you can upload your own fonts and your own picture to use as a background, which gives you unlimited freedom! Download the app now and start creating a clock widget you’ll love! Minimal Clock is a very cute minimalistic widget. It shows time (hours in the middle and minutes on the side), day of week and battery level (optional; represents an arc around the clock). You can change colors of all the details separately. You can customize transparency. You can choose what app to open at the tapping of the widget. You can get this app! 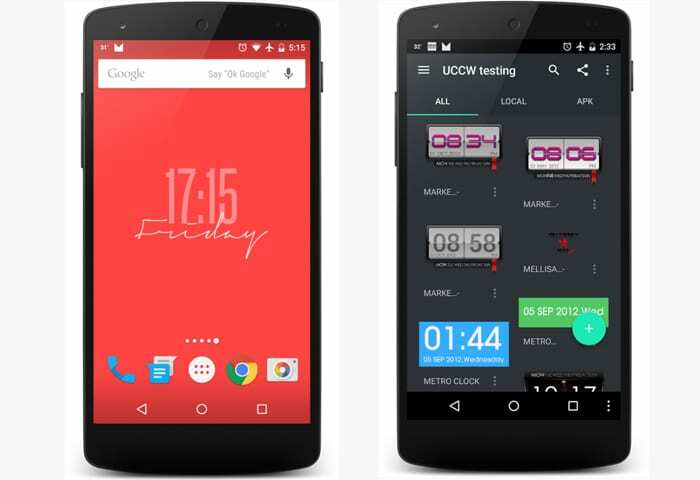 Onca Clock Widget is very similar to the app above. It also combines digital and analog clock and it also offers lots of customization features – you can change size, color of every element, transparency. What’s special about this one though is that you can add seconds if you want to (will be shown on the arc) and date (will be located near clock widget and not under it). It’s up to you to choose which widget app is the best! Pretty Binary Clock Widget is the only good binary clock widget on Google Play. The features of the app are shown in the pic below – choosing color, size, background, etc. So, if this design floats your boats, no reason to postpone its downloading! 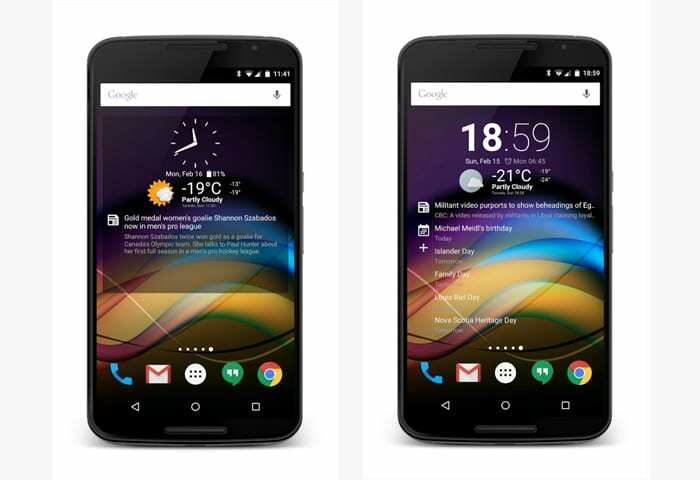 HD Widget is a set of amazing colorful widgets that will make your homescreen look soo great! The app has got over 100 widgets including clock, date, weather widgets and lots of others. Download the app now and never have boring clock widgets again! One More Clock Widget is one more clock widget app to end our list. This one is very cool! It has got over 70 widgets created by freelance artists. You can use any of them, customize them, mix them and so on. The app is free and, what’s more, it is ad-free! Widgets from the app don’t drain your battery, so don’t worry about it – get One More Clock Widget now and let your homescreen look beautiful! So, these were 17 cool clock widget apps for Android. Hope, this article helped you find what you were looking for! Stay tuned and be smart in choosing apps (and widgets)!